Drew Zimmerman, son of Layne and Lisa Zimmerman of Lehi, and freshman baseball player at BYU, has become an outstanding closing pitcher for Coach Mike Littlewood. In four games against Omaha, Gonzaga, Pepperdine, and Utah, Zimmerman came on in relief and shut the teams down. At Omaha, Zimmerman came to the mound for the first time at Miller Field. He threw a 91-mph fastball as he caught a batter swinging. The next two players popped out. Zimmerman’s fastball is often clocked in the low 90’s. 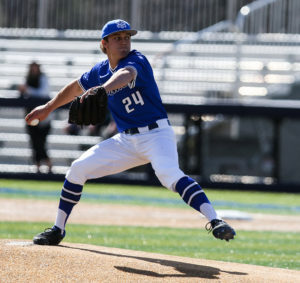 He has an earned run average of 1.25, next lowest of all BYU pitchers. He has 16 strikeouts in 21.2 innings pitched and has allowed only 11 hits. Zimmerman was an All-State Honorable Mention as a high school player. He is a younger brother to six All-State softball-playing sisters and has two younger brothers following in his footsteps.